A CRYSTAL Palace fan from Eastbourne has had his new stairlift upholstered in the colours of his favourite football team. The stairlift designed in team colours was installed in the home of 49-year-old Cliff Gardner. 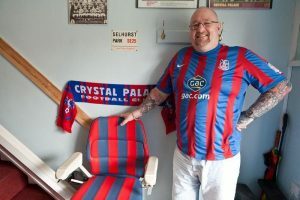 The devoted fan can no longer attend matches in person, so his wife came up with the novel idea of having his new stairlift upholstered in the colours of Crystal Palace – ensuring her husband always feels close to his beloved club. Cliff was injured at the age of 29 in a work accident after he fell eight feet onto a railway track.Since then he has developed severe osteoarthritis in his spine, shoulder, ankles, hip and neck, meaning he spends the majority of his time indoors.